If you keep a paper journal, you might find that a bookmark can be a useful tool for not only bookmarking pages, but also as a source of inspiration for journal writing. To this end, I designed four bookmarks that I have made available for personal download. I’m not a professional designer, but I do like to dabble in graphic design as a hobby, and the online design website, Canva, makes design manageable enough for me to create and share designs, such as the bookmarks I want to share with you. Journal Starters: this bookmark starts off with a quote by Christina Baldwin about journaling, followed by a list of 7 journal starters. 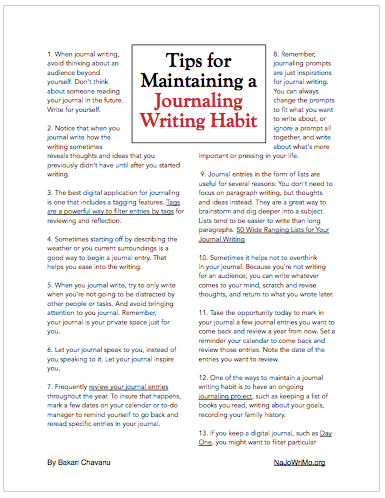 7 Principals of Journal Writing: in this bookmark, I explain my seven principals powerful journal writing. 7-Day Journal Writing Challenge: this bookmark is for encouraging you to journal write for seven days straight. The PDF downloads are available in the NaJoWriMo Resource Library, along with other PDF guides. If you’re existing subscriber to this website, the password to the library is a part of the NaJoWriMo newsletter emails. If you’re not yet a subscriber, subscribe by using the above form, and you’ll be immediately sent a newsletter with password to the library. Note: after you download and open a bookmark in your web browser, it may look very big, but it’s actual printing size 2”x6”.